"Tea Time" is a sketch inspired by this story. It was drawn by qtjene, whose work can be found on DeviantArt. It is a warm, sunny day in July. 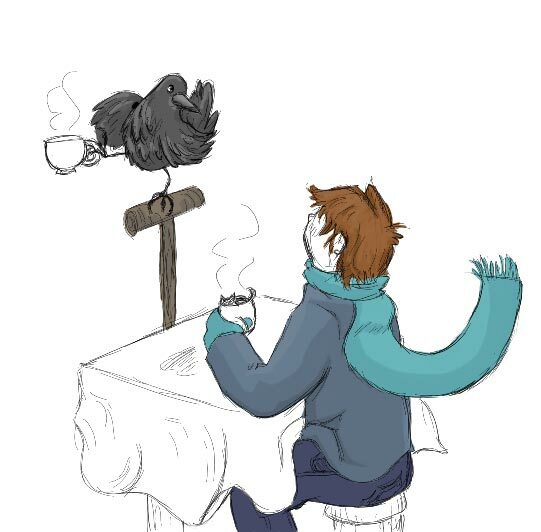 The snow falls gently around a coffee shop where a boy and a crow sit outdoors, sipping tea. The crow asks the boy when he thinks the end of everything will be. “It has already occurred,” says the boy. The boy laughs, explaining, “It’s really quite simple. One can even use geometry to describe it. Time is akin to a ray. It has a definite beginning, but no end. It goes on forever. Everything that has ever occurred and will ever occur already exists. Were this not so, a time traveler could not go to the past, for it would have come and gone, nor to the future, for it has not yet occurred. “The end of everything would obviously be the end of time as well. This doesn’t mean time simply stops, becoming a line segment, having a definite beginning and a definite end, rather than a ray. Then all that had occurred before the end would still exist, and that would be something. A time traveler could eternally avoid the end of the world by returning to the beginning whenever he or she reached the end. At this time the black cat curled up inside the boy’s teacup yawns, steps out of the cup and stretches. Every one of its joints makes a loud cracking noise, as it gets quite cramped inside a teacup. The boy glances inside the coffee shop, wondering when his tea will finally be served, before responding, “You are assuming that I meant time to be a single ray. There is a single central ray, yes, but shooting off from it are an infinite amount of other rays. Alternate universes form for every possibility. More and more universes branch off of those branches, et cetera, et cetera. “Fascinating,” purrs the cat, slowly melting into a stain of tea on the tablecloth. “So what do we do about it?” asks the crow. The crow, content with the answer it was given, takes to the frigid December air. As it makes its way though the muggy night air, it wonders if it should go to the coffee shop to have tea with the boy. After all, it has been so long since they spoke last, and the crow had for some time wanted to ask the boy when he thought the end of everything would be.